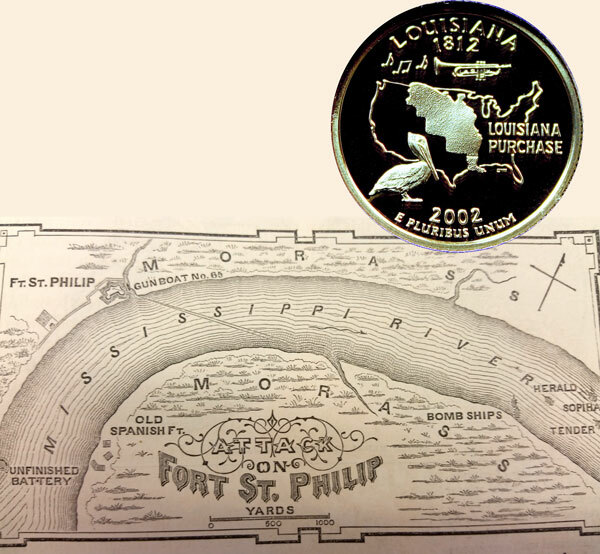 Today, the Louisiana State Quarter Coin remembers the retreat of the British from Fort St. Philip after more than a week’s bombardment on this date 201 years ago. Copy of a letter from Major Overton, commanding Fort St. Philip during the late bombardment of it, to Major General Jackson, Fort St. Philip, January 19th. 1815. On the 1st of the present month I received the information that the enemy intended passing this fort to co-operate with their land forces, in the subjugation of Louisiana, and the destruction of the city of New Orleans. To effect this with more facility, they were first with their heavy bomb vessels to bombard this place into compliance. On the grounds of this information, I turned my attention to the security of my command. I erected small magazines in different parts of the garrison, that if one blew up I could resort to another; built covers for my men to secure them from the explosion of the shells, and removed the combustible matter without the work. Early in the day of the 8th inst. I was advised of their approach, and on the 9th at a quarter past 10 A.M. hove in sight two bomb-vessels, one sloop, one brig and one schooner. They anchored two and one quarter miles below. At half past eleven, and at half past twelve they advanced two barges apparently for the purpose of sounding within one and a half miles of the fort. At this moment I ordered my water battery under the command of Lieutenant Cunningham, of the Navy, to open on them. Its well directed shot caused a precipitate retreat. At half past three o’clock, P.M. the enemy’s bomb vessels opened their fire from four sea mortars, two of thirteen inches, two of ten, and to my great mortification, l found they were without the effective range of my shot, as many subsequent experiments proved. They continued their fire with little intermission during the 10th, 11th, 12th, 13th, 14th, 15th, 16th, and 17th. I occasionally opened my batteries on them with great vivacity, particularly when they showed a disposition to change their position. On the 17th in the evening our heavy mortar was said to be in readiness. I ordered that excellent officer Captain Wolstoncraft of the artillerists, who previously had charge of it, to open a fire, which was done with great effect, as the enemy from that moment became disordered, and at day light on the 18th commenced their retreat. And having thrown upwards of a thousand heavy shells, besides small shells from howitzers, round shot and grape, which he discharged from boats under cover of the night. Our loss in this affair has been uncommonly small, owing entirely to the great pains that was taken by the different officers to keep their men under cover; as the enemy left scarcely ten feet of this garrison untouched. The officers and soldiers through this whole affair, although nine days and nights under arms in the different batteries, the consequent fatigue and loss of sleep, have manifested the greatest firmness and the most zealous warmth to be at the enemy. To distinguish individuals would be a delicate task, as merit was conspicuous everywhere. Lieutenant Cunningham of the Navy who commanded my water battery, with his brave crew, evinced the most determined bravery and uncommon activity throughout. And in fact, sir, the only thing to be regretted is, that the enemy was too timid to give us an opportunity of destroying him. I herewith enclose you a list of the killed and wounded. A list of killed and wounded during the bombardment on Fort St. Philip, commencing on the 9th and ending on the 18th January, 1815. Captain Murray’s artillery—killed 2; wounded 1. The Louisiana State Quarter Coin shows with a map of the 1815 battle with the British at Fort St. Philip.